All this month on Tuesdays, I’ll be sharing Gross Motor Strengthening games and activities we’re doing to help Becca with her Gross Motor skills. She really struggles sometimes in this area (I did too as a kid), so I’ve been looking for fun new ways to get her moving. She loves the Amazon Original show – Creative Galaxy . Arty and his friends solve problems through art! In one of the real life craft examples between episodes, some kids were making bowling pins out of water bottles. Well, we don’t have water bottles, but we do have lots of puffs containers from lil Brother’s snacks! 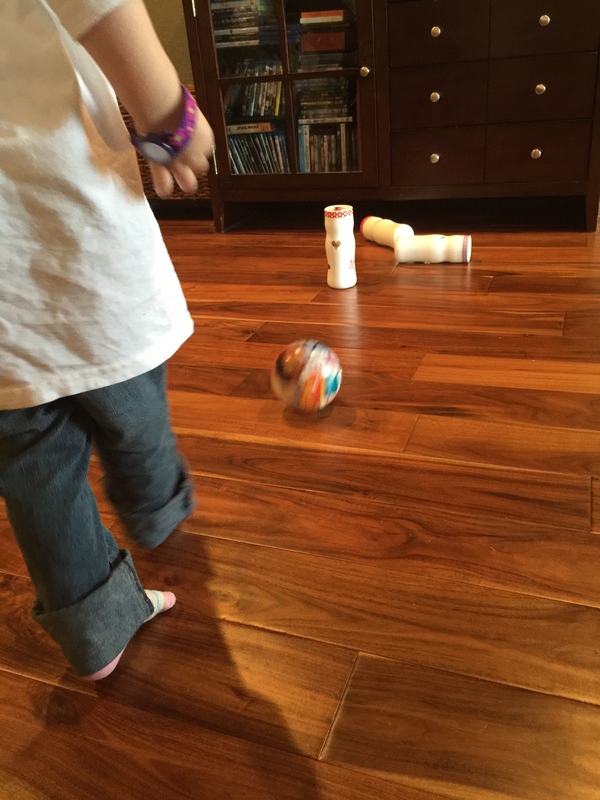 So, we decorated puffs containers and turned them into bowling pins! 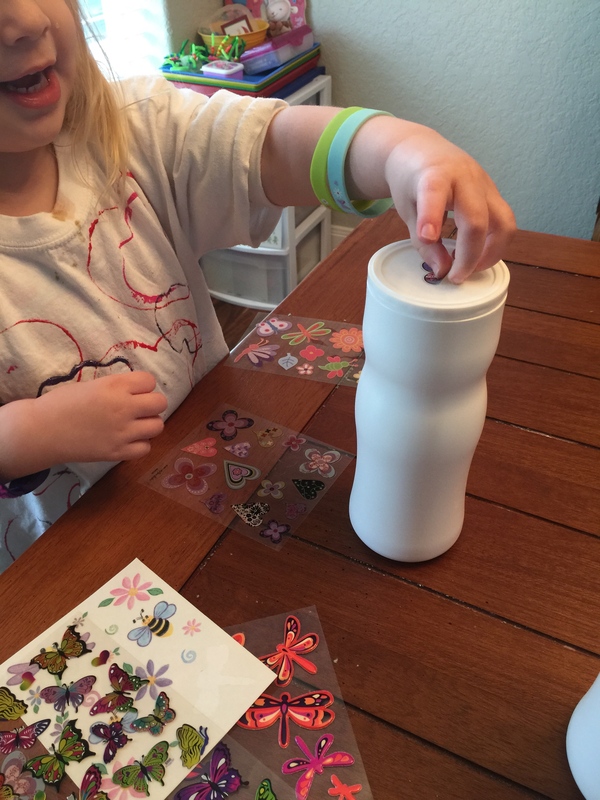 (I taped the lids on with Washi tape and then she added stickers. 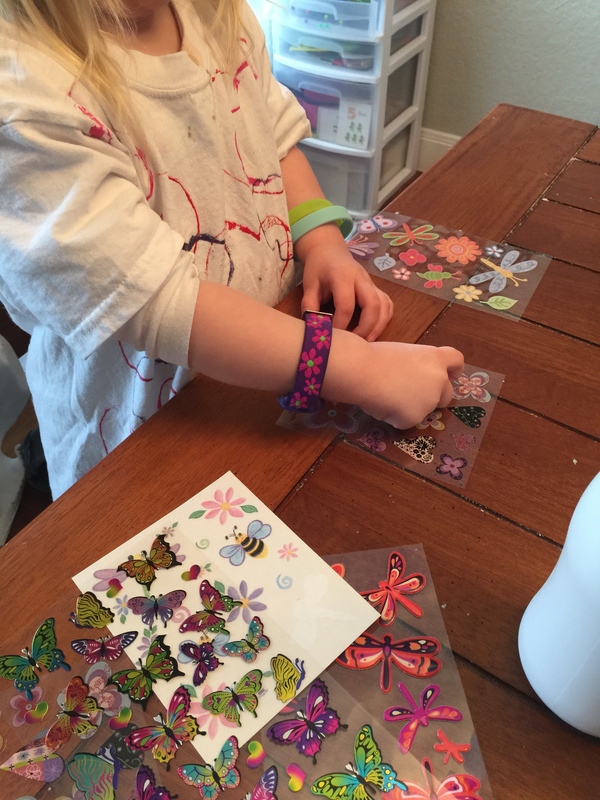 And… bonus… if you pick 3d stickers to put on them like I did, it takes quite a bit of fine motor control to get them off of the sticker sheet, as well. 😉 I’m a sneaky Mommy like that. ) 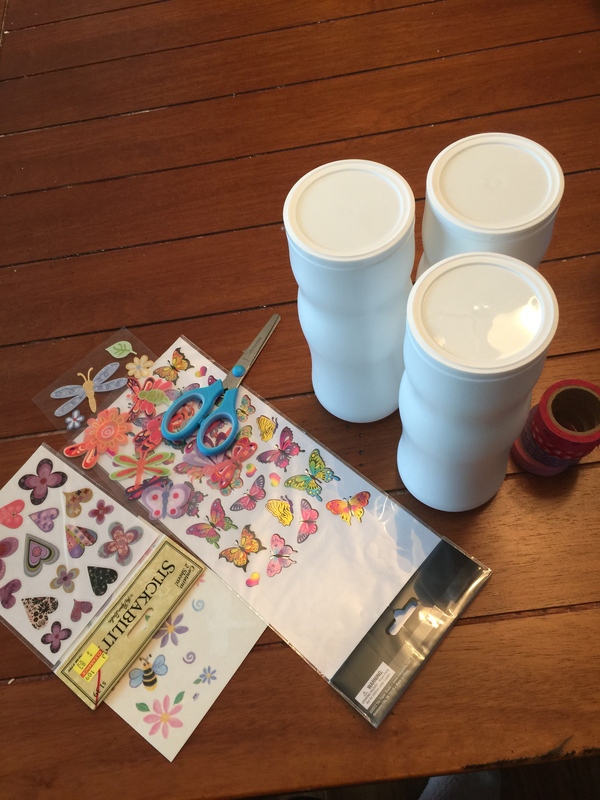 So to do this activity in your own home, you could easily use water bottles, puffs containers, Pringles containers, or even empty shampoo bottles – get creative! They just need to be tall, skinny, and lightweight so your child can be successful at knocking them over. We set them up, and she tried rolling the ball to knock the pins over. It worked partially. And then she decided to kick the ball and see if she could knock them over. Success! 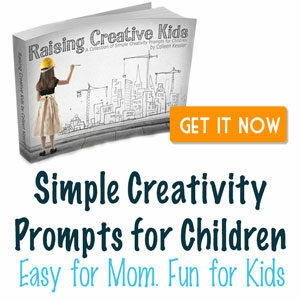 So, the fabulous thing about this activity is that it includes some art and creativity, and then the pins can either be for kickball or for bowling! One day use it for one, the next day, try it for another! 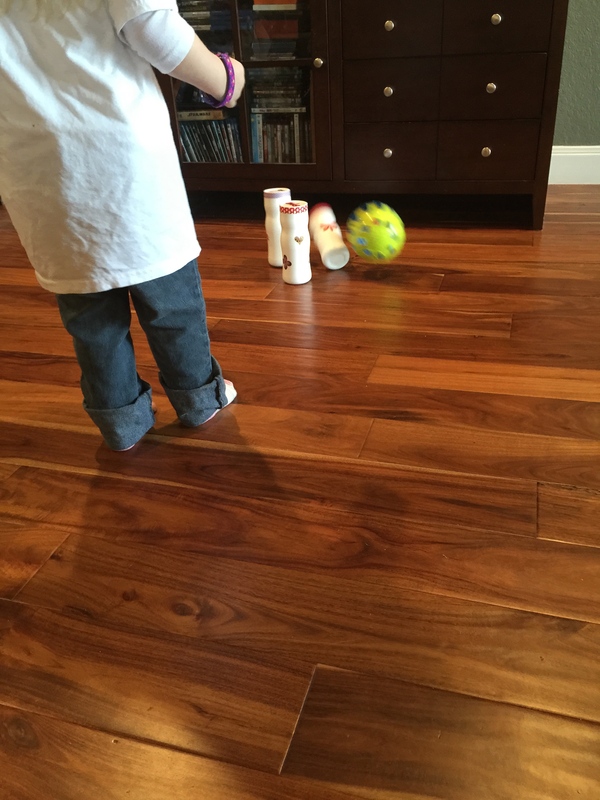 Talk about really working out those Gross Motor skills all with one simple activity! You could easily do this outside on the driveway if it’s a beautiful day, or inside if it’s cold and rainy/snowy! I love the flexibility behind this activity. Like this post? Please be sure to check out my Facebook page, where I share not only my own ideas, but also posts from other parents & professionals that can help you with your kids! Simply click on over to www.facebook.com/butterbeesandbumbleflies or click “like” on the button to the right.